This is the first bear or any stuffed animal for that matter I've made. I saw it on DIY Knitty Gritty and just had to make one. I've named her Luanna. I think she turned out pretty good considering the amount of uncertainty and questioning what I was doing. I have since bought some brown yarn and will try another bear, but I think I'll try it in the round to eliminate all the seaming; this will require steeking which I haven't done before though. is dedicated to providing comfort and hope to children affected by HIV/AIDS in emerging nations, by giving them a gift of love in the form of a hand-knit or crocheted bear. 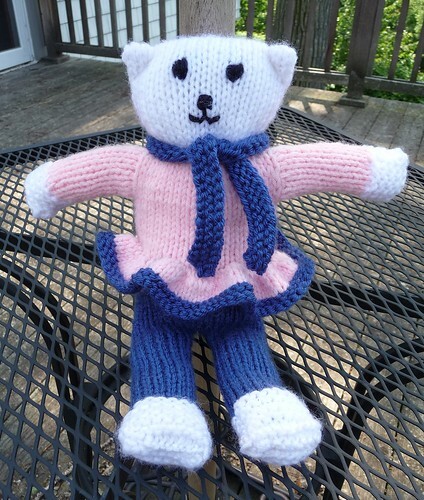 The simple gift of a hand-knit bear with a tag signed by the knitter has touched children with the message that they are unconditionally loved.